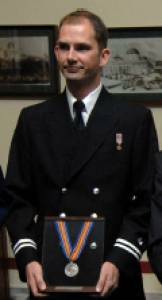 An Silver medal from the Association for Rescue at Sea was awarded on September 25 to Canadian Coast Guard Auxiliarist Michael Cupit for outstanding achievement in the performance of duty while serving as crew aboard a US Coast Guard vessel on 25 April 2007. During a training exercise in Homer, Alaska the crew overheard a distress call from the 39-foot charter vessel HALIBUT ENDEAVOR stating they were rapidly taking on water and making way toward the nearest shore. The crew noted the position of the vessel and immediately responded. Transiting through 3-foot seas and 20-knot winds, the Auxiliary team arrived on scene in 20 minutes. Coxswain Taylor and crewmembers Liebe, Miller and Cupit exhibited extreme skill and superior decision making that made the rescue successful. The skilful actions of the crew were instrumental in saving the lives of 13 people.